Today I bring you swatches of three gorgeous Maisie Shine polishes that are to be released tomorrow! 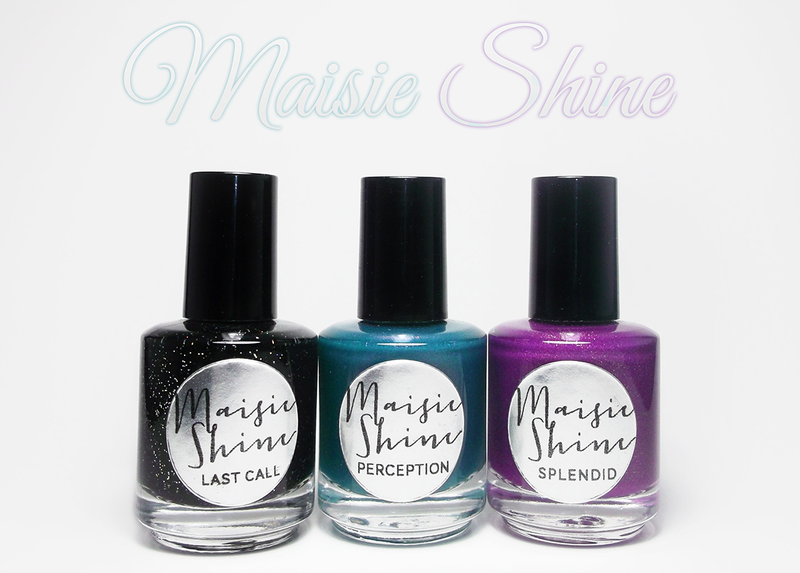 Perception is a dark teal jelly with a gorgeous fuchsia shimmer that shows through wonderfully. This polish was fairly easy to apply, though gets harder if you take your time with it as it dries pretty quickly. When I first swatched this on my nail wheel I was getting what looked like balls/strings of pigment. I haven't had the problem since first swatching it, however. I do suggest checking it on something other than your nails in case it's just something with the polish formula that needs to get out before it's fine. Splendid is a deep purple jelly with gold shimmer that again shows through so nicely, especially in light. I had the same problem with this polish but as I said, it hasn't happened since the first time and everything seems fine now. Beautiful :D I've missed seeing your swatches! I love love love all three of these! They are gorgeous! !